Posted October 22, 2015 by Maloney & filed under Blog Post. 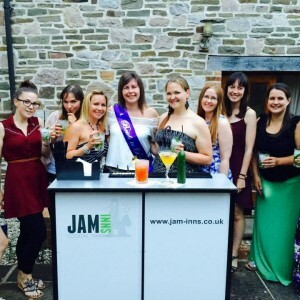 Jam Inns has been hosting Cocktail Classes for years but during 2015 we've noticed a bit of a shift in the Hen party market with quite a large number of groups now looking at mid-week Hen Parties. Typically we've seen almost all our groups for Hen Weekends being on the weekend however with difficulties securing the right accommodation & activities the groups want in premium times of the year we've found quite a significant number of Hens trying out a mid-week Hen Party. There does seem a lot of sense in looking at a mid week break. Jam Inns are taking bookings now for Fridays & Saturdays right the way through till the end of 2016 now. It's sometimes difficult in busy periods for groups to get all the activities they want in a few days away so going mid-week can often make activities more accessible for groups to get the times & locations they want. If your booking a Hen Break away during 2016 & your struggling to book in all the things you want, it could be worth considering a mid-week Hen Party break. Jam Inns caters for Cocktail Classes in England & Wales & these are most commonly hosted at cottage break & holiday home rentals. We bring everything along on the day needed for the class. Have a browse of our website & you can get quotes instantely on our website on the quote page.